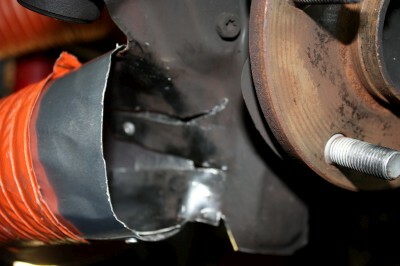 I recently fabbed up some brake ducts for my '91 Turbo after experiencing brake fade at the track. I tried to make them look like they belong on the car, while making them as functional as possible. As you can see from the pics below- they feed from the stock fog light location, through the fender, and into a modified backing plate. This gets the cool air directly into the center of the rotor. Since I put them in, I've had no fade problems at all! An 11' section was enough to get it done, with a little left over. My car had factory fogs- they needed to come out permanently for this to work. Start by removing the underbody panels that attach to the front lip. Then remove the plastic panel that was behind the fog lamp. Plastic shroud panel behind the fog light. Remove it from behind the bumper. There are two plastic "rivets" holding it in place. One's visible from the front, the other's hidden underneath. I picked up some 3" to 4" duct adapters at Lowe's. Cut down the 4" side, so that it's almost flush. Put the adapter in the upper outside corner, and use a sharpie to outline the inlet. I used Gorilla tape to block off the area that wouldn't be filled by the inlet. Fit the inlet in place. Put the plastic plate back in place. The backing plate- rotor inlet. Remove your rotor- take a pair of tin snips and cut down the backing plate. I went ahead and trimmed as much as I could, while leaving some barriers in place near the suspension attachments. Be sure to leave the "scoop" mostly intact! I cut the scoop into 3 strips, so I'd have something to attach to. Make a 3" tube out of aluminum flashing. Use the duct to make sure it's the right size. You'll need to figure out the right angle for the inlet, and trim it to fit. Drill the 3 "fingers" that you made from the backing plate scoop, and pop-rivet the inlet to them. You'll want to make this into an oval near the center of the rotor, so that more air hits the eye. Cut an oval in the fender liner. I used the slanted area next to the tie-down eye. Don't make it too big at first- it's easy to enlarge it if it's too small. Slide the duct through the hole, and up towards the inlet you made. Attach the hose to the backing plate inlet, use a stainless hose clamp. Make sure you mount your widest tires- and adjust the route so that nothing hits. Be sure to try this at extreme steering angles! You can squeeze the ducts to ovalize them for clearance. Last edited by lspector; October 20th, 2016 at 19:13. Great work, this looks like an essential modification for any track goer. Bravo. i would like to see how it holds up. N/A Guys tune/replace and modify the items that are allegedly good till 700+WHP? They've survived 6 track days so far, including a couple of lawn mowing excursions... The only sign of wear is a little bit of scuffing on one of the hoses where a tire must've rubbed. Did you make any block off plates for when it rains? Nice! Any pics of of front from a distance? Here's a view from the front- with my solution for rain. Racer's tape! Nice work. Can I see a pic from the front w/o the tape on it. This is the best head-on view I've got at the moment. Last edited by phatvw; September 10th, 2009 at 16:51. The duct is basically as close as you can get to the wheel hub. So its as close as you can get to the inner rotor vents. How would you do it differently without fabbing a custom flange? Last edited by phatvw; September 19th, 2009 at 13:35.